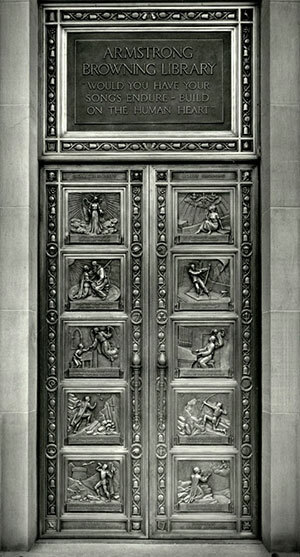 Modeled after the fifteenth-century baptistry doors by Ghiberti in Florence, these solid bronze doors, weighing three-quarters of a ton each, feature ten bas-relief panels repeated on both sides that embody themes from ten of Browning's poems. The doors, sculpted by Robert Weinman of New York, provide not only an entrance into the building, but also an introduction into the rich world of the poetry of Robert Browning (1812 - 1889) and his poet-wife, Elizabeth Barrett Browning (1806 - 1861). Busts of the Brownings; their son, Pen (1849 - 1912); and their close friend, John Kenyon, greet you at the entrance. The focal point of the room is the life-sized portrait of Robert Browning done by Pen Browning shortly before his father's death. Pen also styled its magnificent frame of bursting pomegranates. It hangs above the dais displaying Browning's desk and chair used in his study in London. Gracing the top section of this focal wall is a quotation from Walter Savage Landor's tribute "To Robert Browning." so inquiring eye, or tongue so varied in discourse. On the outside wall are three magnificent double stained glass windows that were created by Charles J. Connick Associates, Boston. These windows represent three of Robert Browning's best short poems: on the left, "Rabbi Ben Ezra" ("Grow old along with me! The best is yet to be"), "Abt Vogler" ("On the earth the broken arcs; in the heaven a perfect round"), and, on the right, "Saul" ("Tis not what man Does which exalts him, but what man Would do"). With 62 stained glass windows, the Armstrong Browning Library contains the world's largest collection of secular stained glass. 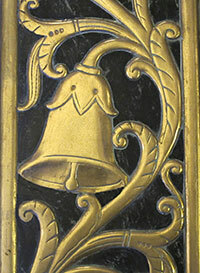 Throughout the Armstrong Browning Library building, and especially prevalent in the Martin Entrance Foyer, is an artistic motif of bells and pomegranates. In addition to the striking brass border inlaid into the terrazzo floor, bells and pomegranates surround the bas-relief panels of the bronze entrance doors, are prominent in the stained glass windows, appear in the molded plaster ceiling; and a frame of bursting pomegranates surrounds a portrait of Robert Browning painted by his son in 1889. The bells and pomegranates motif was inspired by a series of poems published early in Browning's career in eight pamphlets (1841 - 1846), which he entitled Bells and Pomegranates, a name symbolizing the music and meaning of poetry. The religious associations of the term are found in Exodus 28: 34-35, where the border of the high priest's robe is described as being decorated with bells and pomegranates. 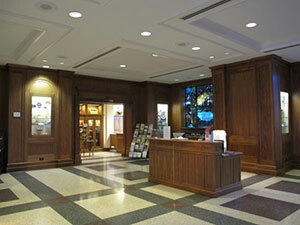 The design of the McLean Foyer of Meditation takes its inspiration from Leighton House in London. The original home, an eclectic composite by artist Frederick Leighton (1830 - 1896), a high-Victorian academic classicist and President of the Royal Academy from 1868 until his death, features a domed room called The Arab Hall. The Foyer of Meditation at 40' x 40' is larger and more subdued in effect except for its five-foot dome finished in 23-carat gold leaf. A two-ton bronze chandelier hangs from the center of the dome over a mahogany table, which is an enlarged reproduction of one Pen Browning had in the Palazzo Rezzonico in Venice. The inlaid paneling of black walnut and the three cathedral windows arching up to 26 feet complete the palatial atmosphere of the room. The filigree ironwork in the windows adds an exquisite touch to the room while the variegated tones of stained glass subdue the brightness of the sun's rays. Tall columns of red levanto marble flank each window while an Italian garden scene painted on canvas on its upper walls gives the room its meditative quality. I say, the acknowledgment of God in Christ accepted by thy reason, solves for thee all questions in the earth and out of it. "A Death in the Desert"
Therefore to whom turn I but to thee the ineffable name? Builder and Maker Thou, of houses not made with hands. "Abt Vogler"
"The Cloister of the Clasped Hands" is the name commonly used for the alcove just under the balcony of the Foyer of Meditation. Popular as a place for marriage proposals and weddings, its walls are adorned in gold leaf with the poems that Robert and Elizabeth Barrett Browning wrote of their love for one another. On one side, Sonnet 43, the most famous of Elizabeth's Sonnets from the Portuguese, begins, "How do I love thee? Let me count the ways." On the opposite wall is an excerpt from Robert Browning's Invocation from The Ring and the Book where he pours out his feelings for his "lyric Love, half-angel and half-bird, And all a wonder and a wild desire." Although the poets spoke of their inseparableness even after death, it is remarkable that not a single contemporary photograph or portrait is known to exist showing both poets together. Ironically, neither are they buried together. Robert is interred in Poets' Corner in Westminster Abbey, while Elizabeth is buried in the English Protestant Cemetery in Florence. Their friend, Frederick Leighton, whose home inspired the Foyer of Meditation, designed Elizabeth's tomb. The Cloister also houses a bronze cast of the poets' clasped hands made in 1853 by American artist and personal friend of the Brownings, Harriet Hosmer. Mounted above the clasped hands is a fictitious illustration of the Brownings' courtship painted by John Carroll for the Eaton Paper Co. The company was promoting the power of letter-writing, since the Brownings had carried on most of their courtship through the mail before meeting in person. The plaque beneath the painting contains a line from one of Robert's letters, "Dear, dear Ba [Elizabeth's nickname]...I believe that, when I have been your husband for years...if I were separated from you for a day and a letter came...my heart would move to it just as it now does." The painting was a gift from the Eaton Paper Company. 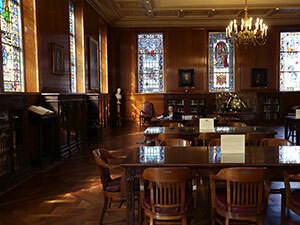 The atmosphere of the John Leddy-Jones Research Hall is one of dignity and charm combined with utility, produced in part by the spacious study tables surrounded by rare black walnut paneling and a Gothic oak floor in the Marie Antoinette design from the Palace of Versailles. The stained glass windows around the outside of the room, created by Jacoby Studios, Saint Louis, Missouri, illustrate ten of Robert Browning's poems. The three oldest windows on the interior wall and inside the Sturdivant Alcove were created by Haskins Studio, Rochester, New York, in 1924. They were moved to the Armstrong Browning Library from the original Browning Room in Carroll Library, Baylor's main library until 1968. The alcove contains several Pied Piper illustrations. Beautifully carved bookcases contain theses and dissertations on the Brownings and biographies of people from the Brownings' era. Among the many portraits of Robert Browning in this room are two painted by the poet's son, Pen Browning, along with a companion portrait of Browning's friend, Joseph Milsand, also done by Pen. Among the art pieces on the walls are bronze likenesses of Browning, an oil painting of his sister Sarianna, paintings of Dr. & Mrs. A. J. Armstrong, and a copy of Guercino's painting of The Guardian Angel. A large display case features many memorabilia items. This room provides an inspirational and beautiful place for Baylor students to study. It is always quiet, and students are welcome from 9:00 am to 5:00 pm, Monday through Friday, and on Saturday from 10:00 am to 2:00 pm. Those especially interested in 19th-century literature can request books and manuscripts from the Library's comprehensive collections. Since the Library is primarily a research center, all requested items are used in the Belew Scholars' Room on the third floor. As its name suggests, the Hankamer Treasure Room houses many special items and is an ideal room for browsing the Library's changing and continuous exhibitions. The Gothic oak floors are in the Marie Antoinette design from the Palace of Versailles, and the plaster and wood ceiling is hand-painted in the Italian Renaissance style. The eleven stained glass windows, created by Charles J. Connick Associates, illustrate Robert and Elizabeth Barrett Browning poems. Five of the paintings in the room are from the Samuel H. Kress Study Collection, several are likenesses of Browning, and one is a Madonna that was owned by the poets. A clock that served three generations of the Browning family sits atop a bookcase on the long wall of the room; the bookcases in this room are filled with biographies of persons who lived during the 19th century. Carved on the chimney of the monumental "blue stone" fireplace is a replica of a Browning coat of arms used by the poet. A handsome table sits in the middle of the room on a Hamadan oriental rug (c. 1925), while a restored John Broadwood and Sons grand piano (c. 1870) stands near the fireplace. At the entrance is a chair and desk once owned by the Brownings. Today Elizabeth Barrett Browning is probably best known for her authorship of the forty-four Sonnets from the Portuguese, five of which are represented in stained glass created by Charles J. Connick Associates of Boston. Elizabeth's writing table and two olive-wood chairs stand near the center of the room, as well as a painting done in 1861 by George Mignaty that captured the Salon at Casa Guidi, the Brownings' home in Florence, Italy. Two large, mahogany cabinets, on either side of an elegant Philadelphia mirror, provide storage space for music composed to accompany the poems of the Brownings. Over 1,500 pieces of sheet music are in the collection. Above the right cabinet is a pastel likeness of Elizabeth, drawn by Eliza Fox-Bridell in 1859. Above the left cabinet are companion portraits of Robert and Elizabeth that were painted by 1853 by American artist Thomas Buchanan Read. These two portraits are the most recent additions to the room. Six side chairs and six arm chairs are reputed to be reproductions of chairs once owned by Elizabeth Barrett at 50 Wimpole Street before her marriage. The mahogany chairs all feature needlepoint seats decorated in a Bells and Pomegranates pattern executed by The Elizabeth Barrett Browning Needlework Guild of Waco. Elizabeth Barrett's afghan pattern is used in the large afghan on the divan and in the miniature afghan in the reproduction of a scene from The Barretts of Wimpole Street. Opposite the miniature scene is a portrait by Alexander Clayton of Katharine Cornell (who played the part of Elizabeth in the play). Hanging on the walls are other portraits of Elizabeth Barrett Browning by Sir William Charles Ross, Edmund Havell, Samuel Laurence, and Valentine Prinsep. 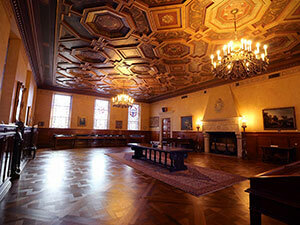 The Cox Reception Hall, created during a 1994/1995 renovation of the ABL's first floor, was funded by a generous gift from Margaret Cox of Houston. Many alumni will remember that the ground floor was once filled with English Department classrooms and offices. 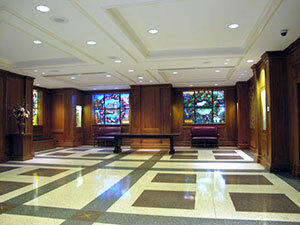 Serviced by a circular driveway on the James Street side of the building, the Cox Reception Hall serves as the primary entrance and information center for tour groups and visitors. The added protection of a porte cochere provides easy access and entry for the physically challenged and for catered events. In keeping with the grandeur of the main floor of the building, the walls of the Cox Reception Hall are paneled in walnut and the floor is polished terrazzo. Glass-front cases surround the room and display an outstanding 300-piece Wedgwood Collection. Six stained glass windows, the newest in the building, beautifully illustrate Italian locations of significance in the lives of Robert and Elizabeth Barrett Browning. Further descriptions of the windows can be found in the Stained Glass Windows section of this website. A handsome mahogany table, useful as a serving space, makes this room an ideal setting for university-sponsored receptions, small dinners, and luncheons. 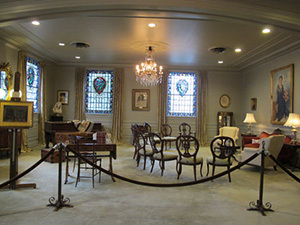 Immediately adjacent to the Cox Reception Hall is the ABL Gift Gallery, which provides a selection of unique Victorian gifts, souvenirs, and books regarding the Brownings and Victorian life. The Mary Armstrong Seminar Room, the Cox Lecture Hall, as well as a temperature and humidity controlled book stack area, are also located on the renovated first floor. 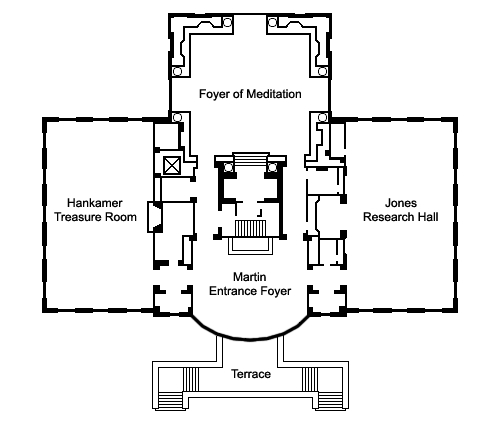 In 2012, library staff and Baylor's administration envisioned the construction of a garden on the grounds of the Armstrong Browning Library to honor Dr. A. J. Armstrong, founder of the Browning collection at Baylor University. The centennial year of Armstrong's arrival as Chair of the English Department at Baylor was the perfect occasion to fulfill Armstrong's uncompleted plan. 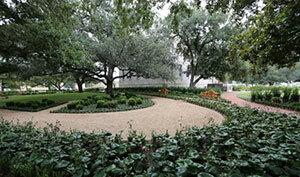 The Office of James Burnett in Houston began work in late June 2012; and on September 14, 2012, Armstrong's longtime dream of a Garden of Contentment was dedicated. Anchoring the garden are four live oak trees that were planted during the original landscaping of the Library in 1953, and nine other live oak trees surround the area. New plantings include: Baby Gem Boxwood, Japanese Yew, Giant Ligularia, Mondo Grass, and Asian Jasmine. Crush granite walkways are graced by eight teak wood tables, each with two matching chairs, and twelve teak wood benches, many given in honor or in memory of loved ones. A dedication plaque at the street entrance pays tribute to those who made the garden possible. It is gratifying that the Garden has become a popular study area and meeting place for students. 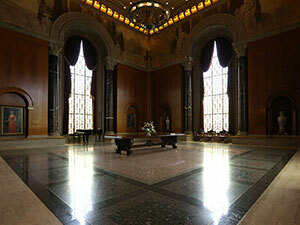 It is also an elegant setting for the occasional wedding and for university functions.